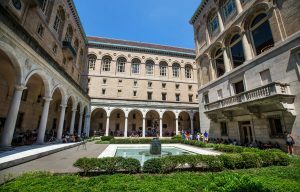 Boston Public Library’s Concerts in the Courtyard (www.bpl.org/concerts) series returns Friday, June 1 and runs through Friday, August 31, bringing a range of free music to one of Boston's most beautiful spaces during one-hour concerts throughout the summer. Concerts are held twice each week on Wednesdays at 6 p.m. and on Fridays at 12:30 p.m.
Lula Wiles, Friday, July 6 ● 12:30 p.m.
Venezuelan Project, Wednesday, July 11 ● 6 p.m.
John Emil, Friday, July 13 ● 12:30 p.m. Bonus Monday Concert: Paulina Voices, Monday, July 16 ● 12:30 p.m.
One Drop: A Bob Marley Tribute, Wednesday, July 18 ● 6 p.m.
Jah Spirit, Friday, July 20 ● 12:30 p.m. Bonus Saturday Concert: Boston Youth Symphony Orchestras, Saturday, July 21 ● 12:30 p.m.
Jose Soto, Wednesday, July 25 ● 6 p.m.
Area 9 Quartet, Friday, July 27 ● 12:30 p.m.
Niu Raza, Wednesday, August 1 ● 6 p.m. Properly Unprepared, Friday, August 3 ● 12:30 p.m.
Abigail Lim-Kimberg, Wednesday, August 8 ● 6 p.m.
Grupo Fantasia Quartet, Friday, August 10 ● 12:30 p.m.
Tyson Jackson, Wednesday, August 15 ● 6 p.m.
Boston Saxophone Quartet, Friday, August 17 ● 12:30 p.m. Autumn Jones, Wednesday, August 22 ● 6 p.m. Cold Chocolate, Friday, August 24 ● 12:30 p.m.
Mariano Escalona, Wednesday, August 29 ● 6 p.m.
Boston Lyric Opera, Friday, August 31 ● 12:30 p.m.